Remove the heads and clean the dry fish. Now take a seperate bowl and prepare the marination with turmeric powder,red chilli powder, lemon juice,gg paste and salt ( In US, they don add salt in dry fish to preserve , but in India ther will be enuf salt u don have to add xtra ). 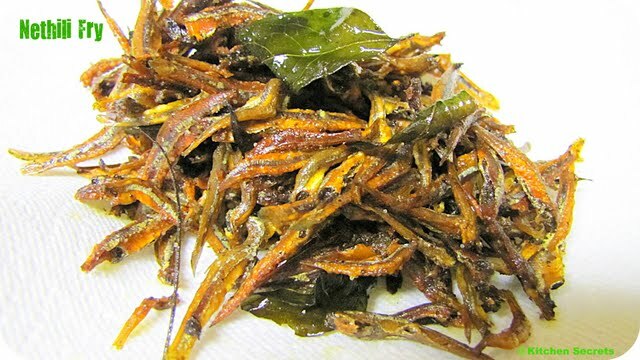 Add the dry fish (anchovies ) to the masala nd marinate for minimum 30 minutes. Now take a pan and pour 4 tbsp of oil. Heat the oil in a medium flame and fry the onions and the curry leaves. Now throw in the marinated dried anchovies and fry it in the medium low flame for 5 minutes by stirring then n there.. So that it fries evenly.. and serve,..
Mouthwatering here, just drooling here..love it with hot steaming rasam..
wow...very tempting fry...its making me hungry now..yum yum yum! wonderful blog and recipes:)..first time here visit me if u can ! thats one super yummy recipe. wow.. i love ur blog and the recipes over here... clicks are awesome... love to follow u.. There is a small giveaway in my blog. Do participate in it! I love love love this..yumm!!! nver have tried like this,this looks yummy.